(Lillenas Publications). 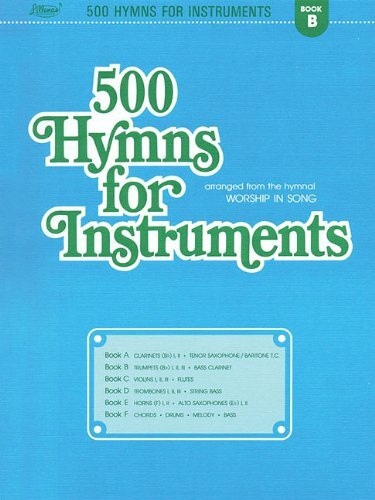 Comprehensive compilation of hymns and gospel songs published for instruments. Arranged by Harold Lane to enable those who play to "praise the Lord with instruments" and contribute vitality to the ministry of music in your church. Spiral-bound. Contents include: A Closer Walk with Thee * A Mighty Fortress Is Our God * Abide with Me * At Calvary * Beneath the Cross of Jesus * Christ the Lord Is Risen Today * Come, Thou Long-Expected Jesus * Crown Him with Many Crowns * Eternal Father, Strong to Save * For All the Saints * For the Beauty of the Earth * Great Is Thy Faithfulness * He Leadeth Me * Holy, Holy, Holy, Lord God Almighty * How Great Thou Art * I Love to Tell the Story * Immortal, Invisible * It Is Well with My Soul * Jesus Loves Me * Joyful, Joyful, We Adore Thee * Let Us Break Bread Together * Love Lifted Me * My Faith Looks up to Thee * Nearer, My God, To Thee * O Come, All Ye Faithful * O for a Thousand Tongues to Sing * Onward, Christian Soldiers * Praise God, from Whom All Blessings Flow * Rock of Ages * Silent Night * Sweet By-and-By * Sweet Hour of Prayer * Thou Didst Leave Thy Throne * 'Tis So Sweet to Trust in Jesus * Under His Wings * What a Friend We Have in Jesus * What Child Is This? * and hundreds more.